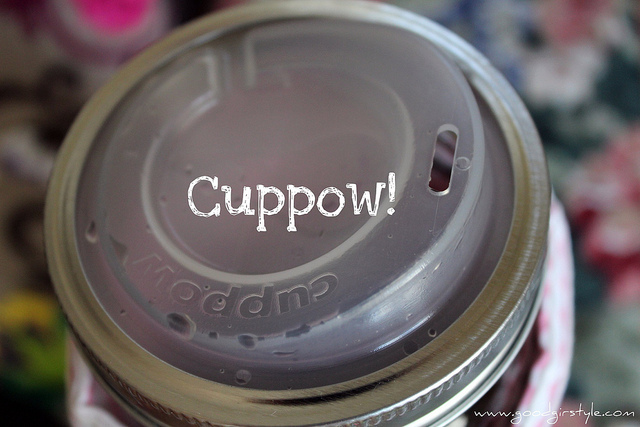 Cuppow solved one of my canning-jar-awesomeness problems. But one more remained--the jar lost heat quickly. My tea was cold before 10am! This was a major no-no for me, since I drink my tea all. day. long. On a whim, I decided to make a cozy for my jar. 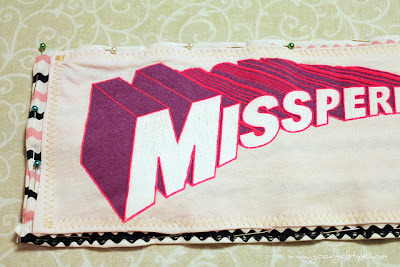 I started (late at night, as these pictures show) with some fabric, felt, and a favorite old tee shirt from high school, along with a paper pattern I made quickly based on the jar. There's no real particular pattern for this, I just cut a piece of paper and fitted it around my jar the way I wanted, then added room for a seam allowance. A zig-zag stitch around the edge of my clever slogan tee secured it to the main fabric and mimicked the background design. Then I cut a piece of felt and fit that inside the layers for added warmth. 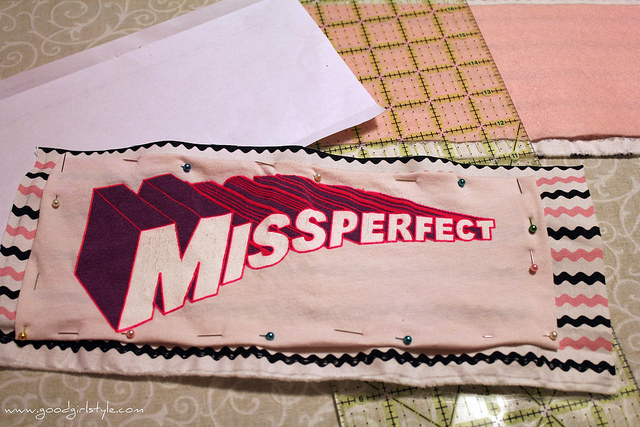 And sewed all the layers together. Then I made two tabs from ribbon, and sewed velcro on the tabs and other end of the fabric. This way my cozy comes off and is easily washable in the event of spills. 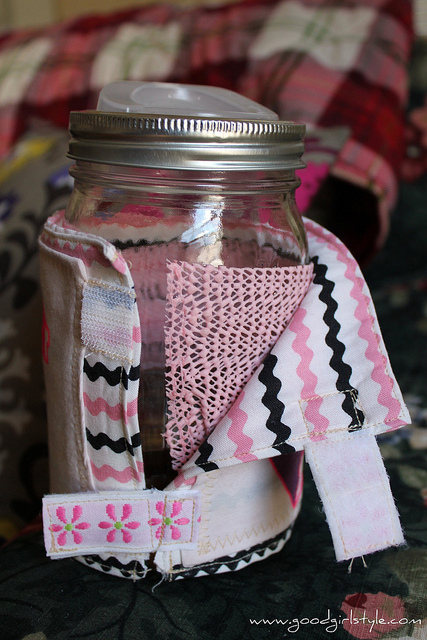 Since the glass jar is slippery, and I didn't want the cozy to potentially slip and cause me to drop the jar, I cut a piece of pink shelf-liner that I just put on with my cozy. This makes it totally secure, and I never feel that the cozy is slipping. I thought about attaching the shelf-gripper to the cozy itself, but then it wouldn't be washable. The two generally peel off together, and I just roll them up for next time! Perf! Also, of course, when I'm travelling, I use the metal canning jar insert lid, and then just switch it out for my Cuppow when I'm actually drinking. 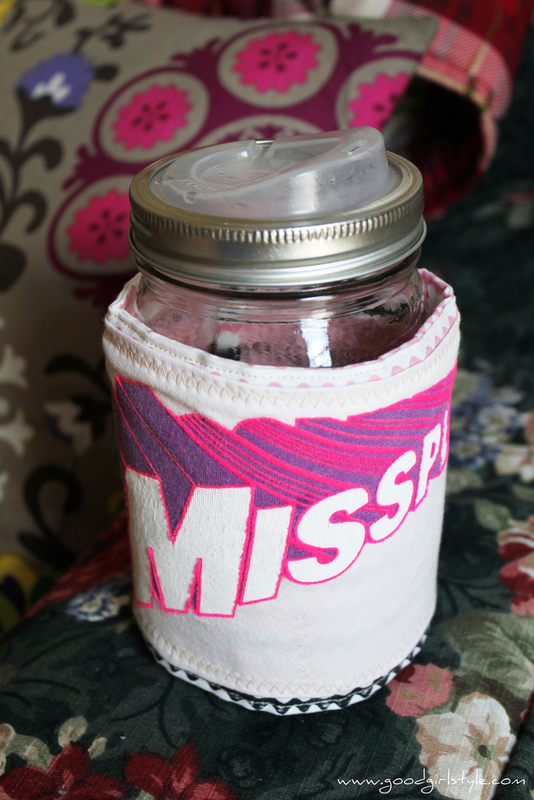 This makes it so easy to throw the jar in my bag without worrying about spills. 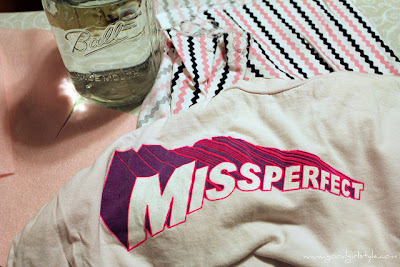 Your jar is now super eco-friendly, super-awesome, super-easily-drinkable, and super-awesomely labelled with the quirky "MissPerfect" sleeve. Happy sewing, and happy coffee/tea drinking! Aww, I envy that design oh my God! I hope I can mimic the design for printing vinyl t-shirts. Such artistry! Thanks for giving me that cool idea. Cheers!